The magazine explores the realms of contemporary art, music, and intellectualism and the impact they’ve had on culture and development. With zero budget, little to no design skills, and minimal knowledge of the industry, pioneers Wayne Anthony (who was a staple of the UK party scene as a result of his acid house raves) and Siruis23 of Spiral Tribe were able to create a thriving publication. The magazine was so successful that they were even able to interview legends like Goldie, Noam Chomsky, and Douglass Rushkoff. The impact and legacy that the project has had on the art world is commendable and an inspiration to aspiring creatives and entrepreneurs everywhere. It was a no brainer for me to reach out for an opportunity to speak with Wayne. Prox: You were heavily involved in London’s nightlife before you began the magazine. What are some of the influences and philosophies that you picked up in the scene that contributed to the overall aesthetic and philosophy of the magazine? Wayne: The ethos of our magazine was drawn directly from the do-it-yourself attitudes of Acid House (1987-1990). If you want something badly enough why wait around for someone else to build it when you can realize your visions independently of established brands. Creating a magazine from thin air was never going to be easy but past experiences gave us an unflinching belief in what we were doing and how that must be achieved. Key to the success of this new venture would be uniting many disciplines under one banner. Prox: What are some early setbacks that you dealt with in the beginning? Was there anything that happened that almost made you give up on the process? How did you navigate these setbacks? Wayne: I guess it depends on how one defines “setbacks.” When I approached co-founder Siruis23 with the basic premise of launching a magazine, we’d never actually met in person and only spoken a few times on Facebook. I was looking for Acid House stories for another book I was putting together and he contributed a story to the book. He doesn’t even live in the UK, which also presented challenges, but I had a good feeling about him and felt he was a workaholic like myself. We didn’t know graphic design and had very basic Photoshop skills. We had zero marketing and promotion budget plus we were entering a new industry. Everything was against us from the very start but we buckled down and aimed high. Prox: Artistically, what are some aesthetics that seem to be found only in London? How have these elements changed with the widespread use of the internet? Wayne: London is probably one of the busiest street art graffiti locations in the world. Artists flock to different boroughs to paint, tag or slap up custom-made vinyl stickers. You’d be hard-pushed to find something unique when artists are moving from city to town, leaving creative marks in their wakes. High visibility spots such as Brick Lane caters for large street art tours throughout the day as well as footfall from neighboring businesses. This ensures local artwork is shared instantly across the internet, a perfect tool for artists working in public places. Prox: While you tend to select individuals from many different disciplines for features and interviews, what are some of the main traits that you look for in those selected? Wayne: We have two platforms, one the magazine and the other our blog. When it comes to the magazine we consider the content very carefully and this is the reason we can approach such heavyweights for interviews. Many of the people we interview aren’t considered famous, we prefer infamous as that denotes an action to be remembered. Our interests are vast so finding interviewees that reached the top of the class, even if only for a moment, these are the people that make this world a colorful place. Prox: For you personally, what have been some of the most important tenants of maintaining a successful, long-running magazine? Wayne: First and foremost you have to love what you do, if you don’t, any setbacks will seem like disasters. Siruis23 was a great partner to have because we totally trusted one another to deliver content needed for each issue. We didn’t need daily meetings or memos because we set a target and pulled the trigger. Remembering he was in another country, popping round for a beer wasn’t straightforward. We produced ten issues together that amounted to over four thousand pages of rich content. Siruis23 then moved on to his next amazing project, which has since been touring the world. Today we promote hundreds of artists each week via our website and social media network. Our Facebook page is a hive of activity with over half a million dedicated followers of all persuasions. We’ve been promoting crowd funding campaigns for the last six months and helped dozens of innovators achieve their dream goals. We’ve always been keen on unifying different disciplines rather than dividing everything into demographics. Prox: What are some pointers you can give to people as far as layout and structure of the actual magazine goes? Could you tell us some things you’ve seen in other publications that are turn offs as far as readability goes? Wayne: Neither Siruis23 nor myself come from graphic design backgrounds but we’re more than willing to learn everything we need to get the deed done. Regardless of the job, place or format, we take this approach to anything we do. Sirius23 taught himself Indesign and I, Photoshop, so we weren’t terribly concerned with layout and structure in the beginning. If we sought perfection we’d probably never produced a single issue. Creating everything in-house meant the only person you really relied on was your partner in arms. We later brought in Coco to design the magazine covers from elements we supplied. Readers might not rate our DIY design skills but they couldn’t fault the rich content or the sheer volume of work found in each issue. Wayne: Selecting favorite artists or interesting people in general is way too hard of a decision for me to make, considering I see in excess of one thousand new pieces of art each week. We loved the Vice business model and were trying to carve our own path in the UK, except we didn’t have a tenth of their budget or manpower. I still envisage this model and the idea of grooming both a free magazine and TV network. As an avid documentary watcher I’m discovering new intellectuals every week. I normally pick a subject and OCD my way through hundreds of hours of material before moving onto the next leading subject. Wayne: Quest for knowledge, outdoor pursuits, world travel, photography. Prox: Tips for aspiring entrepreneurs and those looking to start their own publication? Wayne: Never let the words of people or society stop you from realizing your dreams. Aim for the big picture and make sure that every waking day brings you closer to achieving that desire. Sometimes it can be lonely, difficult or disempowering but if you remember the bigger picture and the reasons why you embarked on this complicated journey, you will eventually reach that platform. There are no failures but learning opportunities to grow and fulfill ambitions. Personally speaking, there’s no greater satisfaction than plucking an idea from my head and seeing it through to the rollout stage. I’ve worked within numerous industries and been successful, I’ve also lost a ton of money. As a person I’ve grown in ways that can only be measured by the trials and tribulations of the projects I’ve brought to the global stage. If you can train that little voice inside your head to say YES instead of no, then you have a fighting chance. Wayne: I’ve been working on a project I called The Peace Helmet Project, which takes ex-issue police riot helmets and converts them into beautiful artwork. I currently have twenty-five helmets but I’m hoping to acquire some funding to bring the total to one hundred. 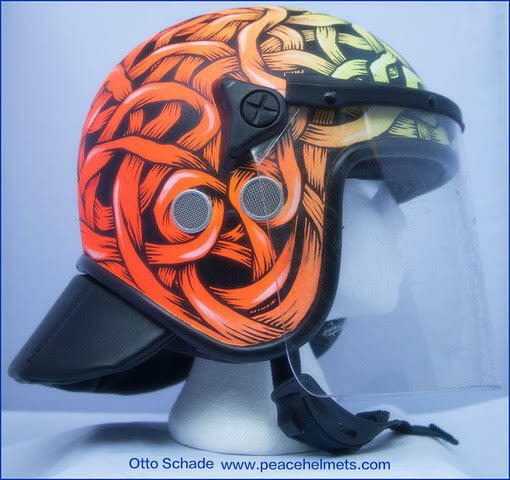 Selected artists from around the world have already painted a Peace Helmet, when the full set has been completed the helmets will be exhibited and then sold. Most profits will go to charities or foundations helping kids and young people. You can learn more about LSD Magazine and read more issues, here.